The Jewish Quarter in the Old City draws millions of visitors from all around the globe each year. People of every religion and ethnicity come to learn about this small Jewish neighborhood that has stood firm for over 2000 years now. The most iconic symbol of the Jewish Quarter is, of course, the Western Wall. However, the magic of this place goes beyond the historic wall of the Temple. 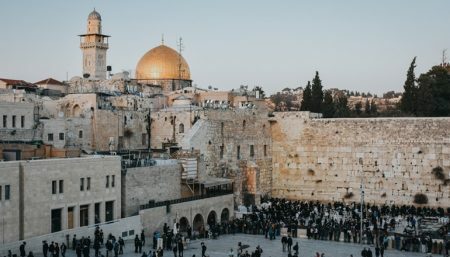 The Company for the Reconstruction and Development of the Jewish Quarter has been working intensively for 50 years now, and it has restored some of the most beautiful and historically significant archaeological sites. One can spend an entire day visiting and admiring the different sites at the Jewish Quarter. If you already have at least 2 of the Quarter’s sites on your list, we recommend checking out the company’s latest offer (link below) which combines 4 Jewish Quarter sites at a special price. It is a perfect way to plan your tour so that you can fully experience everything that the place has to offer. So where will you go and what will you see? Get ready to embark on a historical voyage during which you will see treasures from the First Temple, witness the luxurious life of the Second Temple Cohanim, walk on beautiful Roman streets, and admire well-preserved byzantine mosaics. Let’s go! In order to truly experience the Jewish Quarter, first you need to learn a little bit about the history of the Jewish people. There is no better place for this purpose than the Davidson Center. The Davidson Center is both a museum and an archaeological park. You’ll find archeological finds and remains dating from the First Temple and the Second Temple periods. Admire the City Wall, the pilgrims’ staircase leading to the Temple, and the ancient ritual immersion baths. Wander around the site and walk on an ancient main street where many pilgrims had walked before you. The word on the street is that Rabbi Akiva and Rabbi Yohanan Ben Zackai used to visit frequently that same street. Underneath this street, you’ll find a drainage channel. This drainage served Jewish fighters as a hiding place from the Romans. If you wish to fully understand the pilgrimage experience, we recommend taking a moment to look at the topographic model of Jerusalem, the short video and the archeological finds exhibitions that are displayed at the museum. Now that you’ve learned about the history of the place, and you are fully equipped with facts, dates, and discoveries, it is time to move to one of the currently most desirable attractions: The Hurva Synagogue. The story of the synagogue begins somewhere in the 15th century, at times when Jews had no right to acquire land in Jerusalem. The synagogue was first built in 1864 and it stands on a piece of land which the locals refer to by the name of “The Ashkenazi Court” (Hatzar HaAshkenazim). This synagogue was bombed during the War of Independence in 1948, and was finally reopened only in 2010. Visiting the place, you are guaranteed to feel a strong sense of meaning and purpose. Excavations revealed an entire Jewish neighborhood! What’s most fascinating about it is that this is not just another collection of ancient houses; the Herodian Quarter is a luxury neighborhood. As it turns out, the Second Temple period was a time of prosperity and luxury for the residents of Jerusalem. Just as the name suggests, the Herodian Quarter was established during King Herod’s rule in Judea and it is assumed that the Temple’s Cohanim (priests) used to live here. Learn about the rich culture of those who lived in this place through ancient mosaics and artwork. Discover ancient elegant lounges, Mikvahs and kitchen utensils, and get introduced to the daily life of the rich ancient world. After your visit to the Herodian Quarter, head over to a magical place called “Gag Haramban” (The Ramban’s roof) and then continue your journey and move towards the most beautiful street in the Old City. Welcome to the most enchanting street in the Old City. “Cardo” is the name that was given to main roads around the Roman Empire. One of those “Cardo” streets crosses the Jewish Quarter, all the way from Damascus Gate to David Street. The existence of this street means that life and action were always present in this area. The street was found after the discovery of a mosaic map of Jerusalem depicting the street, which was exposed on the floor of an old Byzantine church. Even though this street is Roman by definition, it is also possible to notice some byzantine architecture inside the Cardo. Tip: save the Cardo for the end of the trip. It is a beautiful place where you can chill and relax, and most importantly – buy some Jewish Quarter souvenirs! If you are planning a private/professional event and you are looking for a unique place, it is good to know that most of the attractions in the Old City offer event venues for celebrations and conferences. Since these are mostly archaeological sites, they often combine their events with guided tours and experiential activities, and events are known to be quite unforgettable. For more information please call +972-72-3932784 or visit the official Jewish Quarter website.